The Celebrity Guests that will participate in the 2010 version of Star Wars Weekends at Disney's Hollywood Studios have been announced. Since this year's events start on the 30th anniversary of the release of The Empire Strikes Back, May 21st, there is a special focus on the Bounty Hunter Boba Fett. Like in previous years, actors and other people who have played key roles in making the Star Wars movies participate in the Star Wars Weekends at Disney World. In addition to the autograph signing sessions and participating in the parades, they also participate in talk show format question and answer sessions. These provide Star Wars fans (and who isn't a Star Wars fan) a unique opportunity to hear first hand experiences about what went into making the various Star Wars movies. In my opinion these special sessions are certainly one of the highlights of all of the Star Wars Weekends events. For 2010 the celebrity hosts for the events will be Jeremy Bulloch (The original Boba Fett from Empire and Return of the Jedi) and Ashley Eckstein (Ahsoka from The Clone Wars). They will be there for all four weekends. Morrison played Jango Fett as well as the clone troopers in the live action movies, while Daniel Logan played Boba Fett and all the clone cadets in Episode II. Baker is the voice of all the clone troopers in Star Wars: The Clone Wars, including the ever popular Captain Rex. Add host Jeremy Bulloch and you have the ultimate Star Wars Bounty Hunter Reunion! There should be some great photo opportunities this weekend. Matthew Wood (pictured center above) provided the voice of General Grievous and is a sound editor on the Star Wars prequels and The Clone Wars. Lorne Peterson is a veteran ILM model-maker who worked behind-the-scenes on all six Star Wars movies. Tom Kane is the voice of Yoda in The Clone Wars, and also the narrator who begins each show with a rousing introduction. 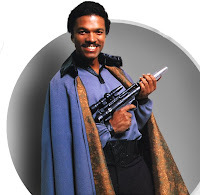 Billy Dee Williams is of course famous for his role as Lando Calrissian, administrator of Cloud City and Rebel hero. Ray Park is the energetic, acrobatic villain Darth Maul from Episode I, and Dave Filoni is the supervising director of The Clone Wars. Ray Park has been a frequent Star Wars Weekend visitor and is known for putting on some awesome demonstrations of the light saber handling that made Darth Maul's brief appearance in Star Wars I so memorable. Ray Park returns for a second weekend, and he is joined by Peter Mayhew, the gentle giant behind the walking carpet -- Chewbacca the Wookiee. James Arnold Taylor provides the voice of Obi-Wan Kenobi in The Clone Wars, as well as Plo Koon. It is always great to see Peter Mayhew. He attends Star Wars Weekends almost every year and is one of the bigger stars to attend regularly. Star Wars Weekends is one of the best annual special events that occurs at Disney World. It is always fun to attend. The event is free with your paid admission to Disney's Hollywood Studios. 0 comments to "2010 Disney World Star Wars Weekend: Celebrity Guests Announced"